It's not long until Gamescom kicks off - just over a week in fact. 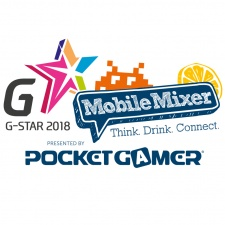 And that means so is one of Pocket Gamer's world-famous Mobile Mixer's. The G-STAR Mobile Mixer, in association with Merculet & Laya.one, offers a great chance to chat with people from across the industry. Perhaps most importantly, there will also be free drinks galore. It won’t just be a simple party though. There’s a chance to catch big industry names from key companies like Gamevil, NetEase and iDreamsKy, who will be on hand to sit on our special panel discussing the latest trends across the games sector in Asia. And don't forget, we are hosting a Big Indie Pitch directly before this event in the same venue, so get yourself signed up to spectate or pitch your game to the press! More information is available here. All of the above is free to attend (though you’ll need to submit an application for the Big Indie Pitch). The Big Indie Pitch, Mobile Mixer and panel will take place at the Hyatt Regency Cologne Hotel on Wednesday, August 22nd. For more details and to grab your ticket, head here.